Director Puri Jagannadh re-launched his son Akash Puri with Mehbooba which was ended up commercially flop at the box office. A few days ago, it was heard that the Akash Puri has signed another upcoming movie. 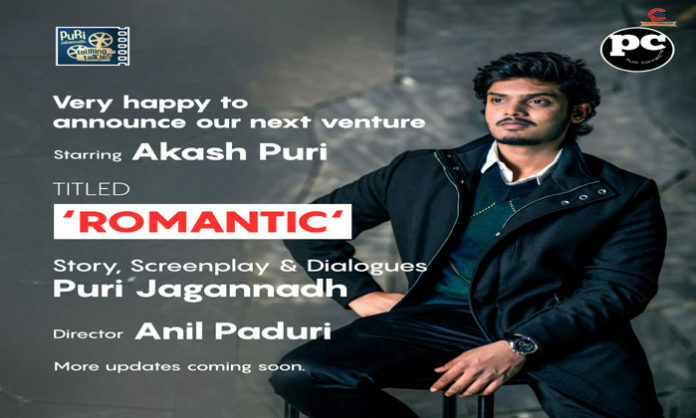 Finally, Puri Jagannadh took to Twitter today and make an official announcement regarding his son Akash Puri New Movie, which has been titled as Romantic. Debutant Anil Paduri will helm Akash Puri starrer Romantic. Puri Jagannadh will be handling the story, Dialogues and screenplay of the film and will produce alongside Charmme on Puri Jagannadh Touring Talkies and Puri Connects banners. Who will play the female lead is not yet finalized. Currently, hunt for the female lead is on. It is heard that recently Akash Puri also did a photoshoot in different looks for the project.